The Unholy Marriage of Music and Math. never heard of these kids before! i hope that xiu xiu != two dudes in a bathtub, though. i can't really tell for sure. 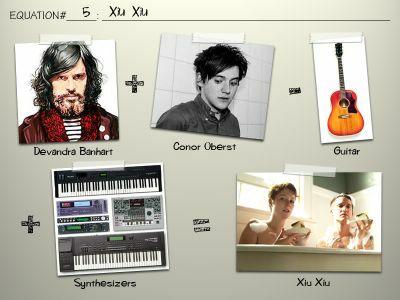 so by substitution, pauly shore * bobcat dolfthwait + devandra banhart + booze + synthesizers - guitar = xiu xiu? It's a guy and a girl. But the guy is gay. i love it. you are genius. Xiu Xiu rule, and it was a surprise to see Connor Oberst with them.